There are two types of American Bullnese being bred: those bred by the American Bullnese Association, which are purebred, and those bred as a cross between the French Bulldog and the Pekingese. See Origin of the American Bullnese for details. This page is on the American Bullnese purebred. If you are looking for information on the hybrid please visit French Buullnese, which some clubs are calling the American Bullnese Hybrid. The American Bullnese should have the appearance of an active, muscular dog of heavy bone and should imply courage and boldness. It should be built low to the ground and long in the body. The head should be large and square. The stop should be well-defined, causing a hollow or groove between the eyes. The muscles of the cheeks should be well developed. The flews should be thick and broad, hanging over the lower jaw. The eyes should be round in form and of moderately large size. The neck should be thick with loose skin at the throat. The ears should soft like velvet with a soft fold. Erect ears are a fault. The body should be heavy in front; chest is broad, deep and full. Well-sprung ribs, broad at the shoulders and narrowing at the loin. The forelegs should be short, stout and slightly bowed and muscular. The hind legs should be firm and well-shaped. Legs which are too long are a fault. The tail should be slightly curled (sickle-like). Screw tails are disqualifying. Any colors are acceptable. The coat should be thick, soft, dense and short. Long coats are disqualifying. The American Bullnese was developed to combine certain features that were admired in a few different breeds of dogs. The American Bullnese has stumpy legs and an elongated body which is responsible for the breed’s adorable, hopping run. The American Bullnese also possesses a unique, happy and clownish temperament, which is accompanied by a large head and chest with a thick upper body. The combination and refinement of these features created an outstanding dog that is regarded as one of the most adorable and revered house pets in the world. Like all dogs, this breed needs a firm, confident consistent pack leader. Do not allow the dog to develop Small Dog Syndrome—human induced behaviors where the dog believes he is pack leader to humans. The American Bullnese is good for apartment life. It is relatively inactive indoors and will do okay without a yard. 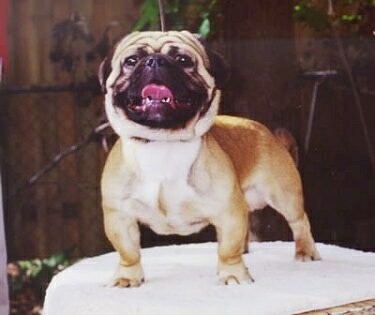 American Bullneses are strong dogs with short, straight legs. They enjoy energetic games and will keep in better health if given regular exercise. This breed should be taken on daily walks. The smooth, shorthaired coat is easy to groom. Brush and comb with a firm bristle brush and shampoo only when necessary. The creases on the face must be cleaned regularly. Being a fan of short-nosed dogs and the bull breeds, Robert E. Rice of Jacksonville, Florida, found himself admiring a few characteristics of several different breeds. Unsatisfied with the current selection of any “one” of the existing breeds, Mr. Rice decided to establish a breed of dog that exhibited all the features he had admired in several of the other existing breeds. The American Bullnese has proven to breed true for multiple generations over the last 20 years. The American Bullnese is a combination of 5 different breeds, only two of which are the French Bulldog and the Pekingese. Somewhere along the line hybrid breeders started crossing the French Bulldog with the Pekingese and the litters were registered with the American Canine Hybrid Club as American Bullnese starting in 2006, making the American Bullnese name officially recognized as that cross. Today there are several hybrid clubs still recognizing the American Bullnese name as a simple cross of two purebred dogs and other breeders have been breeding and registering them as such. Please visit French Bullnese for details on the crossbreed. "The breeding program started by Robert Rice of Jacksonville, FL, in 1989 depended heavily upon pedigree research as line breeding was a technique used to increase consistency in the litters. By selectively breeding dogs with outgoing, happy, and confident temperaments, combined with the desired physical features, Mr. Rice was successful in developing the American Bullnese. Mr. Rice is still extending his pedigrees along with many others who have obtained dogs from this foundation stock and are continuing to develop the breed in its pure state. Many wild guesses have surfaced as to the real genetic makeup of the American Bullnese. We just want to point out that the American Bulldog was not used in the development of the American Bullnese and it is not just a simple cross of two different breeds of dogs. The American Bullnese actually is a blend of five "5" different breeds of dogs."